Precipitation is an all inclusive term denoting drizzle, rain, snow, ice pellets, hail, and ice crystals. Precipitation occurs when these particles grow in size and weight until the atmosphere no longer can suspend them and they fall. These particles grow primarily in two ways. Once a water droplet or ice crystal forms, it continues to grow by added condensation or sublimation directly onto the particle. This is the slower of the two methods and usually results in drizzle or very light rain or snow. 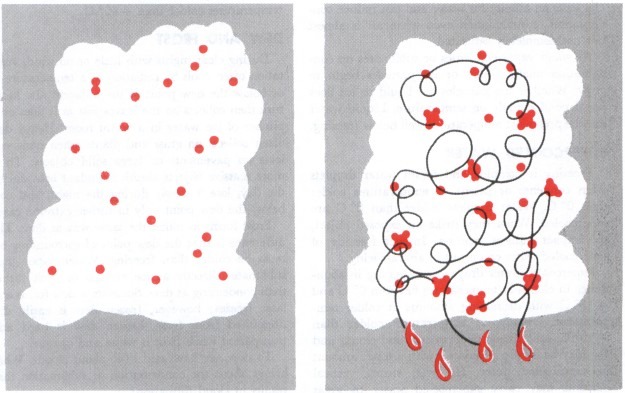 Cloud particles collide and merge into a larger drop in the more rapid growth process. This process produces larger precipitation particles and does so more rapidly than the simple condensation growth process. Upward currents enhance the growth rate and also support larger drops as shown in figure 36. Precipitation formed by merging drops with mild upward currents can produce light to moderate rain and snow. Strong upward currents support the largest drops and build clouds to great heights. They can produce heavy rain, heavy snow, and hail. FIGURE 36. Growth of raindrops by collision of cloud droplets. Precipitation forming and remaining liquid falls as rain or drizzle. Sublimation forms snowflakes, and they reach the ground as snow if temperatures remain below freezing. Precipitation can change its state as the temperature of its environment changes. Falling snow may melt in warmer layers of air at lower altitudes to form rain. Rain falling through colder air may become supercooled, freezing on impact as freezing rain; or it may freeze during its descent, falling as ice pellets. Ice pellets always indicate freezing rain at higher altitude. Sometimes strong upward currents sustain large supercooled water drops until some freeze; subsequently, other drops freeze to them forming hailstones. To produce significant precipitation, clouds usually are 4,000 feet thick or more. The heavier the precipitation, die thicker the clouds are likely to be. When arriving at or departing from a terminal reporting precipitation of light or greater intensity, expect clouds to be more than 4,000 feet thick.